Crude oil and natural gas have posted a spectacular divergence in 09. This is the biggest divergence in the history of the two products in the US in a single year. Shale gas production in the Unites States, due to higher prices and new technology, caused U.S. domestic supply to grow rapidly, to all-time record levels. At the same time, the capacity to import liquefied natural gas (LNG) into the United States was expanded to fill the expected gap from the decline in U.S. production. Now LNG has become a significant supply threat to North American producers during the summer months. 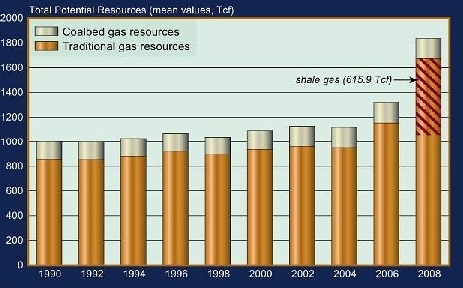 perforating, and hydraulic fracturing), along with higher gas prices, are making shale gas production economical. Well, "higher gas prices" no more. Natural gas supplies in the US are now at record levels. There are numerous highly levered firms that bet heavily on natural gas recovery that are now struggling. The futures curve is quite steep, indicating a near term recovery. However, while crude oil depends to some extent on the emerging markets growth, the US natural gas price in large part depends on the economic recovery in the US - and that may take a while.